A seminar for the members of KAHDEM (Kadınlara Hukuki Destek Merkezi – The Center for Legal Support for Women) within the project "Strengthening Respect for Human Rights of Women in Turkey", conducted by Istanbul Bilgi University Human Rights Law Research Center and supported by Raoul Wallenberg Institute of Human Rights and Humanitarian Law and Swedish International Development Cooperation Agency, on 23-24 May 2009. 25 KAHDEM member lawyers participated from several cities. The training aimed to provide a sustainable sharing of knowledge on the human rights of women. International standards for human rights of women, practical information on how to apply to the CEDAW Committee, international law cases and some cases of Constitutional Court decisions were discussed during the seminar. 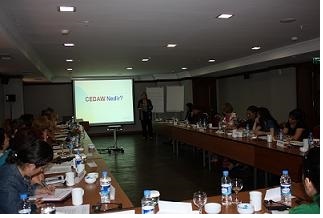 The speakers were; former president of CEDAW committee Prof. Feride Acar (METU-Middle East Technical University), Assoc. Prof. Bertil Emrah Oder (Koc University), Asst. Prof. Dolunay Ozbek, Asst. Prof. Asuman Aytekin İnceoğlu, Asst. Prof Murat İnceoğlu of Istanbul Bilgi University, Sevinc Eryılmaz Dilek (Human Rights Law Research Center) and Dorina Ioana (Lawyer from Interights of Londra).